Can I say that the selection of the top ten finalists for American Idol this season topped with the surprise announcement of the judges’s selection of 3 more wild card finalists was genius! This only adds credence to a season already peppered with high accolades. 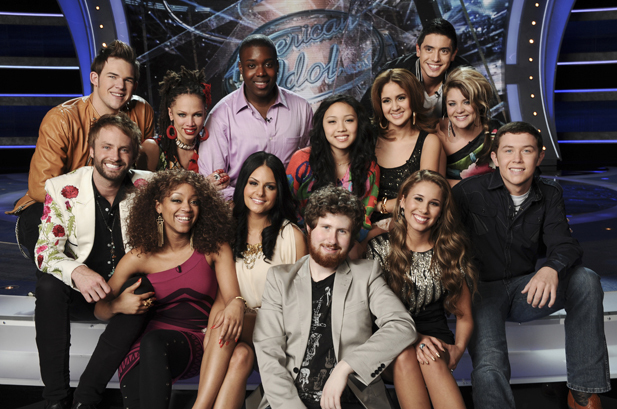 American Idol is on fire and has an added life. The finalists also are packed full of talent and freshness which also spills over to the panel of judges. This bodes well for a show that was teetering on the tired and mundane just a season ago. I believe it is the return of Nigel Lythgoe as Executive Producer. I still think there are some interesting powerhouse talents in both the girls and guys side that can take the title. It is up to performances now. I believe there are going to be some battles. I have not selected my favorites yet I am still going to wait and see. Have you? I enjoyed this. I don’t get cable so don’t watch it. I should see if it can be streamed. That’s how I get most of my TV. Thanks for all your reviews, JP. See you for Potluck tonight, I hope.